This is it. In the blink of an eye, the entire season has flown by, and we’ve now arrived at the two-part finale. Pretty soon we will see that last scenes Steven Moffat ever writes for Doctor Who, and then we’ll have a new Doctor as well as a new producing team. At that point, we’ll have plenty of time to look back on the season and debate its pros (e.g., Bill) and cons (e.g., too many filler episodes). For now, though, we have “World Enough and Time” in front of us, and the question of whether or not all Cybermen episodes of the new era (minus Neil Gaiman’s “Nightmare in Silver”) are kind of the same, dropping the Doctor into a mystery to be explored in part 1 only to result in a cliffhanger revealing the Cybermen to be the enemy, and then a part 2 where the Doctor inevitably wins. They’ve even played the “and the companion gets turned into a Cyberman” card twice now. However, what “World Enough and Time” lacked in surprise it made up for in atmosphere and cleverness. –The Star Trek-esque ship. The opening scene on the ship was enough to fool me into thinking I’d somehow lucked into an early screening of the Star Trek: Discovery pilot. –Missy as the Doctor. I’m a sucker for the TV trope of characters pretending to be someone else (or even full-on switching bodies) on the show because it’s such a rich opportunity for comedy and self-referential commentary. As such, I was in the bag for this episode the moment Missy popped out of the Tardis pretending to be The Doctor, getting everything just a bit if not radically wrong because even if her change of heart (er, hearts) is genuine she’s not The Doctor. It’s not in her personality to do things just like he would. In fact, she comes off almost like she’s a disgruntled Doctor Who fan, dismissively referring to Bill and Nardole as Exposition and Comedy Relief respectively. It’s funny because its true. –The non-linear storytelling tricks near the beginning. Cutting from The Doctor witnessing Bill’s apparent death to the two of them going about their day and debating whether or not to let Missy take a dry run at commanding her own TARDIS and companions was a refreshing example of “we trust our audience to be smart enough to get this” especially since there wasn’t even a courtesy “One Week Earlier” bit of text on screen to signal the flashback. –The creepy atmosphere in the hospital. Nothing says “creepy” quite like people with bags over their heads and crying out for help or at least a mercy killing through computer-translated voices. –Another signature Moffat play with time. Due to the proximity to the black hole, time moves faster at the top of the ship than it does at the bottom, which seems like another classic “Moffat loves to play with time” bit of narrative gymnastics. So, we had the brilliant cross-cutting between the Doctor’s two-minute conversation with the blue-skinned janitor and Bill’s years-long waiting at the hospital where she could view that conversation via a security camera but only on a mercifully slow frame-by-frame basis. An arch of the Doctor’s eyebrow in real time took weeks to happen on Bill’s TV. –The Master in disguise. I didn’t predict Unfrozen Caveman lawyer (i.e., Bill’s new friend) was actually The Master. Instead, I simply enjoyed this quirky character who looked like he should be trying to sell us GEICO car insurance but was actually quite intelligent in his own way and quick with a pretty decent joke. –The Dickensian origin story of the Cybermen. Peasants eking out a living in relative squalor, coughing through exhaust fumes whose cancerous effects have given them all an early death sentence thus leading them to plot a revolution? Cool. That revolution involves turning themselves into emotionless, unfeeling robots? Even cooler. Same goes for the revelation that the arch above each Cyberman’s head is the device which stops them from feeling pain (or anything else, for that matter). –Capaldi’s acting while explaining The Doctor’s affection for Missy and need to help her. Plus, fun with gender pronouns! –Another black companion gets turned into a Cyber, er, person. I don’t necessarily object to this the same way someone would object to black people always dying in horror movies. I more object to this because it’s something we’ve already seen it before. First Danny, now Bill. The primary difference being Danny was a part-timer and Bill a full-timer meaning her Cyberman conversion hurts more, that is if you believe it will actually stick. –The sidelining of Missy for the majority of the episode. After the fantastic opening, Missy is again sidelined, more so than I would have expected from the first part of a multi-Master episode. To be fair, after that opening, Missy, the Doctor and Nardole really only have two scenes, sussing things out with the janitor and then descending down the ship to discover the Cyberman. So, there really wasn’t much opportunity for her to do much, but, still, after that opening I was hoping for more from her this episode. –The Scooby Doo-esque reveal of The Master. This was actually a pretty classical reveal of The Master, but in 2017 there’s something inherently silly about a character pulling a Scooby Doo villain and reaching to their neck to pull off a mask as if we seriously believe their altered appearance had simply been courtesy of a well-picked mask and not the work of supremely talented prosthetics and make-up experts. –The Doctor’s Near-Regeneration. Just have him regenerate already or don’t. Quit teasing us. Also, Capaldi’s “Noooooo!’ was a bit too Darth Vader in Revenge of the Sith for my liking. What about you? What did you think of “World Enough and Time”? Let me know in the comments. Loved the beginning. What a way to start the episode. But it only reminds me that the early faux regenerstion was completely unnecessary and leaves me wandering if this also is a trick. 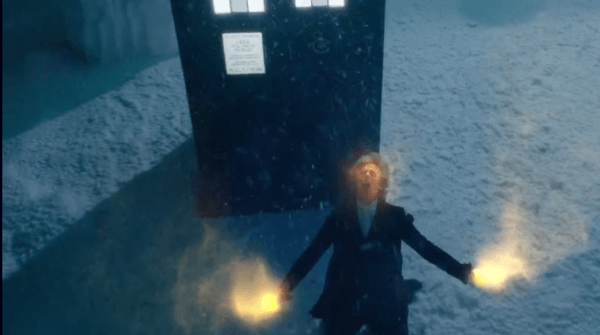 In fact it would ld have been brilliant to start the season with that opening of 12th doctor falling to the ground and glowing like that. Anyway i heard so much about his regen looking different to the other previous new era doctors and so far it looks the same. Aside from that this was a strong episode with good character depth. Why did they squeeze what could be a series worth of storyline into the first half of the episode. Missy training as the doctor. John simm hiding as razor. All this could have made a great story arc. Yep i didnt know that was simm hiding although the master is known for it. I did suss in the end as i knew razor was some famous actor and they gave too many previews of simm returning all of which were shown in a scene with similar background to that one. But as i said before as much as i like john simm, do we really need him to appear now when there is so much else going on in this episode. I have a feeling the next episode is going to be bloated. Did anyone notice that the master’s plan seemed to be to befriend Bill for 10 years so he could sneak up on missy and the doctor. Surely there was an easier way and why didnt Missy remember doing all this? 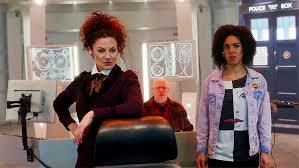 On the plus sode i loved all the doctor who jokes and the time lord lady ones. And the tension with these cybermen were much better than previous episodes of cyberman. You are wrong about the race issue with cybermen. This has been going on for years. Marthas cousin. The first leader of torchwood, brigideer leftbridge stewart, derek pink, now Bill Potts. No biggie. Like you say its supposedly more emotional to see a good person be converted to show the real menace of cybermen way. I happened to watch the forst cyberman episode of bill hartnells first doctor ahead of this episode and this is a true sequel. So whats the bet that we will see the first doctor next week? Twice Upon a Time was the best of Capaldi’s tenure. 10 out of 10. It was a perfectly graceful not to go out on. I thought his actual regeneration scene on the Tardis was maybe a little too long, but I loved the episode as a whole. Will be writing more about it tomorrow. Next Entry Box Office: Indie Films to the Rescue?